Time-lapse animation: The Milky Way over Arizona. I don’t post as many time-lapse videos of the sky as I used to, because of the “been there done that” syndrome. It really takes something special now to make it stand out from the zillions of other animations on the ‘Net. 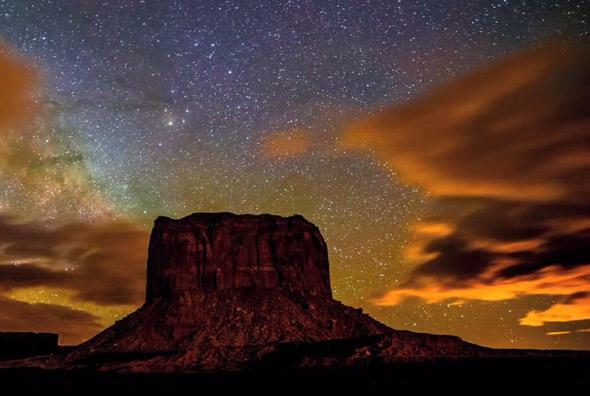 This one stands out: “YIKÁÍSDÁHÁ,” which is Navajo for Milky Way. You’ll see why. Holy wow. The colors! This animation was done by Gavin Heffernan and Harun Mehmedinović (Gavin created the videos “Death Valley Dreamlapse” and “Borrego Stardance,” which have graced my blog in the past). They filmed it in Grand Canyon National Park. I’ve been to this part of the country, and the colors really are that crisp and electric; the red buttes and hoodoos are stunning at sunset. I’m glad they spent a minute letting the natural setting pop out before hitting the night sky. And that they do. The Milky Way is the star of the show; the galactic bulge, disk, and dark fingers of vast dust lanes as clear as if this were taken from space. Well, sort of; I was impressed by the mix of clouds and sky, to be honest. The contrast was interesting, and it’s rather amazing the Milky Way could stand out so clearly above the cloud line. One thing I want to point out specifically: At 2:10 in, a meteor flashes and leaves behind a curling wisp of what looks like smoke. This is called a persistent train, the vaporized remains of the meteoroid itself, and can glow for several minutes. The upper level winds from 60–100 km above Earth’s surface are what blow it into those curlicues. The mirror effect at about the three-minute mark is interesting, too. It’s just a bit of artistic license, much like making the stars streak at various other parts of the video. These videos are fascinating to me, especially the way the natural beauty of the sky merges with the camera motion and music. A photographer with a sharp eye, sense of scenery, and taste in music can really put together an amazing piece of work. I’m glad to be able to share them with all of you.